STOUGHTON, Mass. – In a game in which the largest lead either side had was four through the first three quarters, it was only a matter of time before one side rattled off a game-changing run. 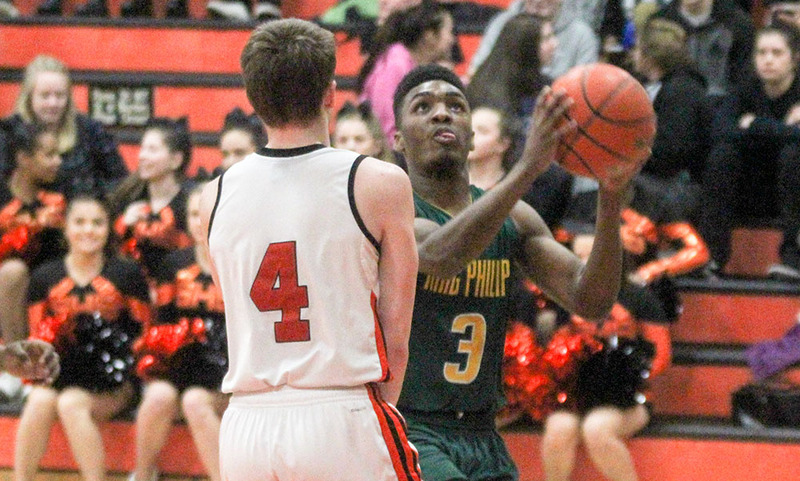 That run came from the King Philip Warriors, who went on a 10-0 spurt that took less than two minutes in the final quarter to pick up a 62-51 win over Stoughton. The teams were tied at the end of the first quarter (15-15), separated by just two at halftime (29-27 Stoughton) and again knotted through 24 minutes of play (42-42). The largest lead at that point was when the Black Knights led 25-21 late in the first half. Stoughton scored on its first two possessions of the fourth quarter on baskets from Cam Gomes (12 points) but wouldn’t add another field goal the rest of the way. Nolan Bradley started the run, taking a pass from Pharoah Davis to tie the game at 46 with 5:44 to play. Seth Sullivan (14 points) took in a defensive rebound and went coast-to-coast for a layup on back to back possessions to give the Warriors a 50-46 lead. Sophomore Kyle Layman (21 points, six rebounds, three blocks) hit a jumper and then found Sullivan on a cut up the middle for a layup to cap the 10-0 run with four minutes to play. A free throw from Stoughton’s Cam Andrews (17 points, seven rebounds, three assists) followed by two more from Craig Goodrich brought the Black Knights within five (54-49) with 3:08 to play but Justin Vine answered on the other end for KP. After a stop defensively, KP missed on the other end but Will Weir grabbed the rebound and Sullivan converted two free throws with just under two minutes to play to make it 58-49. After missing time in the first half because of an eye injury, Sullivan gave the Warriors a big boost in the second half. The senior scored all of his 14 points in the second half with 10 of them coming in the final quarter. Both Layman and Andrews had strong starts for their respective sides. Layman was 4/7 from the field to net nine points in the opening quarter while Andrews was 3/5 (2/2 FT) to lead the Black Knights with nine points as the teams were tied 15-15. Both sides got help from the bench in the second quarter. While Adrian Castillo and Bradley provided a spark for KP, Stoughton got four points from Izon Swain-Price and two points apiece from Justin Ly, Luis Monteiro and Matt Gallagher to take a 29-27 advantage into the break. Although King Philip won the game, the Warriors were held without a three point field goal (0/10). The win marked the second time Layman, just a sophomore, went over the 20-point mark this season. He scored a career-high 24 points earlier this month in a win over Taunton. King Philip (4-8 overall, 3-6 Hockomock) will look to make it two in a row when they welcome Sharon to Wrentham on Friday night. Stoughton (3-8, 2-7) tries to bounce back the same night with a trip to Franklin. Sharon, 40 @ Attleboro, 59 – Final – Sharon raced out to an 18-9 lead after the first quarter, but the Bombardiers climbed back for with a big second quarter to come within two at halftime. The Bombardiers held Sharon to just 12 points in the second half to earn their fourth win of the season. Jake Dunkley led Attleboro with 15 points. Ricardo Ripley scored a career-high 21 points for the Eagles. Canton, 53 @ King Philip, 69 – Final – Click here for a recap of the game. Foxboro, 55 @ Franklin, 67 – Final – Franklin turned a seven point lead (27-20) at the halftime break into a double-digit advantage (50-37) by the end of third quarter. Franklin’s Connor Peterson led all scorers with 19 points while Josh Macchi added 14 points and Paul Mahon chipped in with 12 points for the Panthers. Foxboro’s Andrew Block had a team-high 14 points while Mark Clagg scored 12 points, Joe Morrison had 10 points and Joe Bartucca finished with eight points. Stoughton, 40 @ Mansfield, 71 – Final – Mansfield used a dominate second quarter to stretch a two possession game into a comfortable lead by halftime. The Hornets outscored the Black Knights 21-4 in the second quarter and held a 37-14 lead at the break. Tyler Boulter and Sam Goldberg (six rebounds) each had 13 points while Phil Vigeant added 11 points, with a team-high three three-point field goals. Stoughton senior Izon Swain-Price netted a team-high 11 points. Milford, 56 @ Taunton, 71 – Final – Taunton freshman Dante Law tied a career-high with 18 points to lead the way for the Tigers. Lou Vendrell scored a season-high 15 points while senior Tommy MacLean finished with 13 points. Milford senior Zack Tamagni led the Scarlet Hawks with 18 points while junior Kayden Kelley had 11 points and 11 rebounds for his second double-double of the season. North Attleboro, 40 @ Oliver Ames, 59 – Final – Oliver Ames raced out to a 18-9 lead after the first quarter and used that lead as a launching point the rest of the way. The Rocketeers got it within nine at the end of the third quarter (40-31) but Oliver Ames finished the game by winning the fourth quarter 19-9. Carter Evin and Jack Spillane each had 16 points for the Tigers while Dylan Mahoney added 14 points. Brent Doherty led Big Red with 14 points while Jonny Friberg added 11 points. Attleboro, 92 @ Sharon, 55 – Final – Click here for a recap of the game. King Philip, 46 @ Canton, 23 – Final – Shannon O’Connor led the way for the Warriors with 15 points. Christina Hathaway added eight points for KP in what head coach Martin Crowley called, a “great team win.” Casey Shea was top scorer for the Bulldogs with 10 points. Franklin, 31 @ Foxboro, 52- Final – Ashley Sampson reached the 20-point mark for the second game in a row, leading the Warriors with 22. Lily Sykes chipped in with 17 for the Warriors. Mansfield, 54 @ Stoughton, 33 – Final – The Hornets outscored Stoughton 19-5 in the fourth quarter to break open a close game and pull out the win. Meg Hill led the way for Mansfield with 16 points, 12 rebounds, and nine blocks. Jen Peel added 14 points, five assists and three steals for the Hornets. Stoughton freshman Shyanne Trinh had a team-high 16 points for the Black Knights while Val Whalen had nine points and eight rebounds. Taunton, 39 @ Milford, 52 – Final – Kate Irwin paced the Hawks with 22 points and Jill Burley added 15 in the win. Milford trailed 32-25 at halftime but took control with an 18-2 run in the third quarter and allowed only seven points in the second half. Oliver Ames, 45 @ North Attleboro, 46 – Final – The Rocketeers avenged a one-point loss in last year’s playoffs by edging the Tigers in a game that had “playoff-like atmosphere.” Ashley Ahern was top scorer for North with 15 points and Kayla Raymond led OA with 21. Attleboro, 136.6 @ Franklin, 126 – Final – Attleboro’s Emma Humphrey (36.7) scored a 9.4 on bars, a 9.4 on floor, 9.0 on the vault and 8.9 on beam to lead the Bombardiers to the win. Franklin sophomore Mia Lizotte was not far behind at 36.3, scoring 9.2 on floor, vault and beam and 8.7 on bars. Click here to view the 2016 HockomockSports.com Football Awards. STOUGHTON, Mass. – There have been a lot of football games played on Anthony L. Sarno Jr. Field on the campus of Stoughton High School since 1953. In the over-30 years played on Sarno Field on Thanksgiving, there has been plenty of history made, including the first overtime game in Thanksgiving history in 2012. The Black Knights were able to make a little more history on Thursday in the final game ever played on Sarno Field. Stoughton scored the most points it ever has on Thanksgiving with a 48-0 win over Canton in the 91st meeting between the two rivals on the holiday. Stoughton now holds a 47-40-1 lead on Thanksgiving. The win also marked the largest margin of victory by the Black Knights. It tied the series high (Canton also won 48-0 in 1986). “It was a nice way to end on this field,” said Stoughton head coach Greg Burke, who has called Sarno Field home ever since he took over in 1990. “The kids played tough, they were great all year. I wish we were still playing, I think we’re good enough to have one more game. But but we played our butts off today. 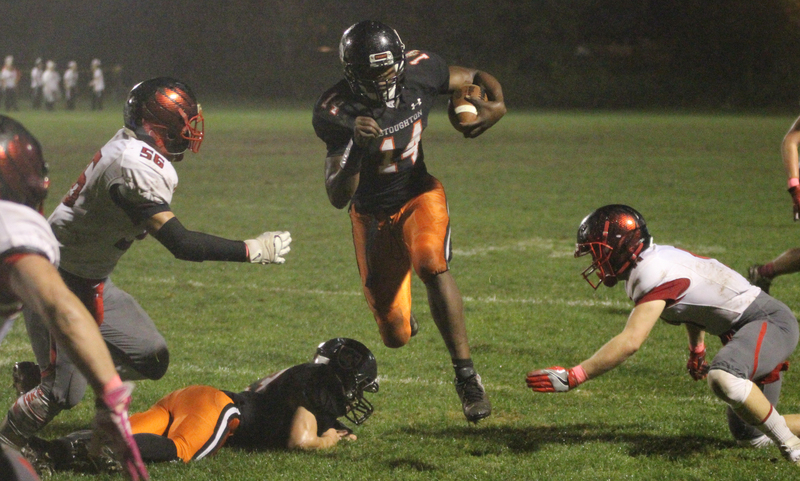 Stoughton seniors Izon Swain-Price and Ryan Sullivan both rushed for over 100 yards and combined for five touchdowns to lead the way for the Black Knights. The hosts scored on six of their eight offensive series and added one special teams touchdown as well. “This is the last game on this field so all week Coach Burke has been preaching that he wanted this to be the best game ever played on this field and I think we succeeded in doing that today,” Sullivan said. Stoughton’s defense forced and three and out on Canton’s opening series and two plays into its first possession, junior Justin Ly found a big gap and raced for a 44 yard touchdown. The Black Knights forced another three and out and again, cashed in two plays later with Swain-Price (3 carries, 108 yards, 3 touchdowns) going up the left side for a 36 yard touchdown and an early 13-0 lead. Swain-Price scored again on his second carry of the game, going up the left side for a 21 yard touchdown that capped a 7-play, 70 yard drive for Stoughton — its longest of the game. The second quarter was more of the same for the Black Knights. On the second play of Stoughton’s fourth offensive possession, Swain-Price took his third carry for 51 yards, toeing the sideline for the last 15 yards, to find the endzone to put the Black Knights up 27-0. After Stoughton’s defense came up with another stop, Sullivan (4 carries, 107 yards, 2 total touchdowns) returned a punt 73 yards with just over two minutes to play in the first half to give the hosts a 34-0 lead at the break. On the first play of the second half, Sullivan raced 59 yards for a touchdown to make it 41-0. Stoughton finished with a 327-107 advantage in yards. Senior Nick Hardy (six carries, 46 yards) scored his first rushing touchdown of the season with a six yard run with 8:38 left in the third quarter. The game didn’t end without a little bit of drama though. Canton used 19 plays to march 63 yards to take up the majority of the fourth quarter. The Bulldogs got 1st and goal from the 4 yard line. After three stops, Canton faced 4th and Goal from the 2 yard line. Stoughton’s Luis Monteiro made the tackle in the backfield to stop Canton, preserving the shutout. Stoughton football finishes the season at 8-3 with a league-high 362 points for. Canton finishes the season at 3-8. Alec Ragusa led Canton with 45 yards on 21 carries while Mike Marino had 29 yards on nine carries. With construction set to begin on the new Stoughton High School at the end of the school year, the Black Knights will be without a home field for at least three seasons. “We’re very happy with the way things finished, I’ve been here on this field for 25 years and now that’s it,” Burke said. “It’s a little sad, it’s a little surreal. I’m happy [for the new field] but a little sad too. We’ll be on the road a lot the next couple of years. 1st Quarter: (NA) Nick Rajotte 2-yard rush (XP blocked). 2nd Quarter: (NA) Bobby Mylod 8-yard rush, Chad Peterson to Kyle McCarthy 2-point pass; (NA) C. Peterson 13-yard pass to B. Mylod, Devin Slaney XP good; (A) Cam Furtado 1-yard rush, XP no good. 3rd Quarter: (NA) B. Mylod 13-yard rush, XP no good; (A) C. Furtado 3-yard rush Paul Deluca XP good; (NA) N. Rajotte 1-yard rush, D. Slaney XP good. 4th Quarter: (NA) K. McCarthy 2-yard rush, D. Slaney XP good. 1st Quarter: (S) Justin Ly 44 yard rush, Josh Cocchi XP good; (S) Izon Swain-Price 36 yard rush, 2pt failed; (S) I. Swain-Price 21 yard rush, J. Cocchi XP good. 2nd Quarter: (S) I. Swain-Price 51 yard rush, J. Cocchi XP good; (S) Ryan Sullivan 73 yard punt return, J. Cocchi XP good. 3rd Quarter: (S) R. Sullivan 59 yard rush, J. Cocchi XP good; (S) Nick Hardy 6 yard rush, J. Cocchi XP good. 1st Quarter: (M) Anthony DeGirolamo 41 yard pass to Mike Shannon, Diogo DeSousa XP good; (F) Mark Clagg 5 yard rush, XP good. 2nd Quarter: (M) Brian Lynch 13 yard rush, D. DeSousa XP good; (M) B. Lynch 1 yard rush, D. DeSousa XP good. 3rd Quarter: (F) M. Clagg 21 yard pass to Trey Guerrini, XP good. (M) B. Lynch 6 yard rush, D. DeSousa XP good. 4th Quarter: (M) A. DeGirolamo 11 yard pass to Hunter Ferreira, D. DeSousa XP good. 1st Quarter: (KP) Shane Frommer 51 yard rush, XP good. 2nd Quarter: (KP) Brendan Lydon 26 yard pass to S. Frommer, XP good; (KP) B. Lydon 13 yard pass to Alex Olsen, XP no good; (KP) A. Olsen 1 yard rush, XP good; (F) Jake Noviello 12 yard pass to Connor Peterson, XP good. 3rd Quarter: (KP) Giovanni Fernandez 5 yard rush, 2pt good. 4th Quarter: (KP) Aidan Bender 60 yard interception return, 2pt good. 1st Quarter: (R) Randolph interception return, XP failed. 2nd Quarter: (M) Matt Curran 1 yard rush, XP failed; (M) M. Curran 15 yard pass to Jack Cappelletti, Sean Lehane XP good; (R) Randolph 42 yard pass, 2pt conversion. (M) Harrison Bliss 1 yard rush, Ryan O’Toole 2pt rush. 4th Quarter: (M) Asong Aminmentse 1 yard rush, S. Lehane XP good; (M) William Pointer 10 yard rush, S. Lehane XP good; (M) J. Cappelletti 10 yard rush, S. Lehane XP good. 1st Quarter: (S) Juvan Elisma 9 yard rush, 2pt run failed; (S) J. Elisma 60 yard rush, XP good. 2nd Quarter: (S) Jeremy Ruskin 5 yard pass to Drew Naisuler, XP good. 3rd Quarter: (S) J. Elisma 40 yard rush, XP failed. 4th Quarter: (S) J. Elisma 80 yard rush, XP good; (OA) Sean Cosgrove 5 yard rusm Max Pacheco 2pt rush. 1st Quarter: (T) Brevan Walker 51 yard rush, Nick Tolan XP good; (T) B. Walker 11 yard rush, N. Tolan XP good; (T) Noah Leonard 41 yard pass to Adam McLaughlin, XP failed. 2nd Quarter: (CC) Connor Rodriguez 65 yard kickoff return, XP failed. (T) B. Walker 21 yard rush, XP failed; (T) N. Leonard 16 yard pass to Andrew Wellington, Jared Taje 2pt rush; (CC) Jacob Cabral 20 yard rush, XP failed. 3rd Quarter: (T) B. Walker 56 yard rush, N. Leonard 2pt pass to A. McLaughlin; (CC) Jackson Murray 49 yard rush, XP failed; (T) N. Leonard 10 yard pass to A. McLaughlin, XP failed. 4th Quarter: (T) B. Walker 1 yard rush, N. Tolan XP good; (CC) J. Murray 20 yard rush, C. Rodriguez XP good. Below are the official 2016 Hockomock League Football All Stars, selected by the coaches in the league. Honorable Mentions were not distributed by the Hockomock League. We will update this post, as well as our History section, when they are made available. 1st Quarter: (KP) Brendan Lydon 1-yard rush, Cole Baker XP good. 4th Quarter: (KP) Alex Olsen 1-yard rush, C. Baker XP good; (M) Jackson Phinney 2-yard rush, Gavin Admirand XP good. 1st Quarter: (D) Nate Ellis 75 yard pass to Miles Linhares, Liam Caulfield XP good; (NA) Nick Rajotte 2 yard rush, Devin Slaney XP good. 2nd Quarter: (NA) Chad Peterson 44 yard pass to Hacmoni Cuevas, D. Slaney XP good; (D) Cole Jacobsen 15 yard pass to L. Caulfield, (NA) Jack Dakin block XP, Neal Doherty 75 yard 2pt return. 3rd Quarter: (NA) N. Rajotte 1 yard rush, D. Slaney XP good. 4th Quarter: (D) C. Jacobsen 37 yard pass to N. Ellis, L. Caulfield XP good; (NA) C. Peterson 4 yard pass to Bobby Mylod, D. Slaney XP good; (D) C. Jacobsen 11 yard pass to N. Ellis, L. Caulfield XP good; (NA) N. Rajotte 50 yard rush, D. Slaney XP good. 1st Quarter: (S) Izon Swain-Price 57 yard rush, XP failed; (S) Ryan Sullivan 47 yard rush, R. Sullivan 2pt rush; (D) Bobby Maimaron 31 yard pass to Devin DeMeritt, XP failed. 2nd Quarter: (D) B. Maimaron 15 yard pass to Miele, Carver XP good; (S) Evan Gibb 37 yard pass to I. Swain-Price, Josh Cocchi XP; (D) B. Maimaron 7 yard pass to D. DeMeritt, 2pt rush good. 4th Quarter: (D) B. Maimaron 4 yard pass to Miele, 2pt good; (D) B. Maimaron 8 yard rush, XP good. 1st Quarter: (C) Alec Ragusa 4 yard rush, Thomas Monagle XP good. 2nd Quarter: (C) A. Ragusa 5 yard rush, T. Monagle XP good; (C) Joe Mulkay 32 yard rush, T. Monagle XP good; (OA) Liston Funai 40 yard rush, Kyle Gagliardi 2pt pass to Brandon Timulty; (C) A. Ragusa 6 yard rush, T. Monagle XP good; (C) Dan Dillon 68 yard pass to Tony Harris, T. Monagle XP good. 3rd Quarter: (C) D. Dillon 17 yard rush, T. Monagle XP good. 4th Quarter: (OA) Curtis Cann 9 yard pass to B. Timulty, C. Cann 2pt pass to B. Timulty. 1st Quarter: (F) Mike Henri 3 yard rush, XP failed; (F) Mark Clagg 35 yard pass to Jamaine Few, XP failed. 2nd Quarter: (F) Mike Luong 8 yard rush, XP good; (F) Matt Mullally 6 yard rush, XP good; (N) Nauset field goal. 3rd Quarter: (F) M. Clagg 20 yard pass to Trey Guerrini, XP good. 4th Quarter: (F) M. Mullally 1 yard rush, XP good; (F) Louis Piccolo 15 yard interception return, XP good. 1st Quarter: (M) Shapel Feaster 22 yard rush, Sean Lehane XP good; (W) Walpole 28 yard pass, XP good. 2nd Quarter: (W) Walpole 37 yard rush, XP good. 3rd Quarter: (W) Walpole 1 yard rush, XP good. 4th Quarter: (M) Matt Curran 9 yard pass to Kayden Kelley, S. Lehane XP good. 1st Quarter: (W) Kyle Thomas 70 yard rush, XP failed; (T) Brevan Walker 10 yard rush, John Teixeira XP good; (T) Noah Leonard 25 yard pass to Adam McLaughlin, J. Teixeira XP good. 2nd Quarter: (T) B. Walker 4 yard rush, J. Teixeira XP good. 3rd Quarter: (T) N. Leonard 50 yard pass to Mike Fernandez, XP failed; (W) K. Thomas 12 yard rush, 2pt rush failed; (W) K. Thomas 2 yard rush, 2pt pass failed. 4th Quarter: (T) B. Walker 15 yard rush, XP failed; (T) TJ Mendes 45 yard rush, XP failed. #17 Canton, 4 @ #16 Bristol Plymouth, 1 – Final – Jake Verille scored a brace for the Bulldogs and Paul Corcoran and Sam Papakonstantino each tallied goals as well. Canton will travel to top seed Nauset on Sunday afternoon in the D2 South first round. #19 Stoughton, 1 @ #14 Medfield, 6 – Final – Jordan Asnes scored the lone goal of the game for Stoughton, finishing off an assist from Noah Schulze. #11 Canton, 1 @ #6 King Philip, 2 – Final (OT)– Andrea McNeil scored the goal for Canton in the 10th minute. Elizabeth Furfari tied it for the Warriors with just 2:30 remaining in the game. Kate Lindmark scored the winner for KP off an assist by Christina Hathaway with 1:10 left in overtime. KP advances to the D1 South quarterfinal and travels to #3 seed Somerset-Berkley on Sunday. #10 Franklin, 1 @ #7 Bridgewater-Raynham, 0 – Final – Alex Sullivan scored in the third minute for the Panthers. Franklin advances to the D1 South quarterfinal to face Walpole at 2:00 on Sunday. #15 Oliver Ames, 1 @ #2 Walpole, 2 – Final (OT) – Just four minutes after Walpole took the lead, Dimitra Efremidis scored off a corner to tie the game with 11 minutes remaining. The Rebels scored two minutes into overtime to get the win. #7 North Attleboro, 3 vs. #10 Bridgewater-Raynham 0 – Final – Rocketeers win 25-17, 25-11, 25-7 and advance to play #2 seed New Bedford on Monday. STOUGHTON, Mass. – Playing a team twice in a season is always difficult. Playing the same team twice in consecutive games presents a whole new challenge. For the second straight week, Stoughton football welcomed Milford to Anthony L. Sarno Field — and for the second week, the Black Knights scored a dominant shutout win. Stoughton scored three touchdowns in the first quarter to set the tone and didn’t allow Milford to earn a first down with its offense until the final drive of the game in a 34-0 win in the Division 2 South Quarterfinals. “It’s tough to play a team twice, I know all the cliches…but you have to play somebody,” Stoughton head coach Greg Burke said. “Hats off to [Milford], they are well coached. I just think we we had a little too much today. The Black Knights’ decision to defer to the second half worked out nicely to start the game. A pair of penalties from Milford forced the Scarlet Hawks to start from inside their own 10 yard line and and were forced to punt. It took Stoughton just six plays to capitalized with Ryan Sullivan (10 carries, 41 yards) to push it in from four yards out. Sullivan rushed in the two point conversion to give the Black Knights an early 8-0 lead. A holding call put Milford — who were without star running back and linebacker Blake Hill — in yet another hole on its second drive and were forced to punt after facing a 4th and 11 from their own 18 yard line. Stoughton sent numbers in on punter Sean Lehane and Black Knight senior Izon Swain-Price jumped up and blocked the punt. The loose ball skipped into the end zone and Swain-Price fell onto it for a 14-0 lead less than seven minutes into the game. Milford had its best starting position of the game when Shapel Feaster intercepted Evan Gibb’s throw, giving the Scarlet Hawks a first down at Stoughton’s 37 yard line. But two plays in, Stoughton came away with a turnover of its own. On a bobbled snap, Stoughton’s Jason Joseph came bursting through the line and scooped the ball up in stride. Sixty yards later, Joseph was in the end zone for his first touchdown and the Black Knights led 21-0 with less than a minute left in the opening quarter. Stoughton tacked on one score in the second quarter, marching 62 yards on nine plays to extend the lead. Highlighted by 19 yard runs from both Justin Ly (six carries, 41 yards) and Swain-Price, Stoughton moved inside the red zone. Ly capped the drive with a three yard plunge and Josh Cocchi’s extra point gave Stoughton a 28-0 lead at the break. The Black Knights added one final score after a long, methodical drive that took up nearly the entire third quarter. Starting at their own 20 yard line after Lehane’s kickoff went through the end zone for a touchback, Stoughton used up nine minutes and 43 seconds to span 80 yards on 14 plays. Alex Sjoquist had the longest run of the drive at 10 yards while only a dropped handoff resulting in two yard loss was the only negative yardage. Facing a third and 12, Gibb hit Ruben Gonzalez for a 26 yard completion down the right sideline to get down to the 1 yard line. Gibb kept it from there, pushing it in on a sneak for a 34-0 lead. Stoughton football (6-2) advances to the D2 South Semifinals to play Duxbury (8-0). The Dragons are the consensus #1 team in the state and have scored nearly 400 points so far (48.9 points per game). The Black Knights will travel to Duxbury for a game schedule for Friday at 7:00. Milford (4-4) will await its opponent for this week to finish out the rest of the season. 1st Quarter: (KP) Shane Frommer 25-yard rush, Cole Baker XP good; (A) Tyler McGovern 28-yard pass to Elvin Sam, Paul DeLuca XP good. 2nd Quarter: (KP) John DeLuca 85-yard rush, C. Baker XP good; (KP) J. DeLuca 9-yard rush, C. Baker XP good. 3rd Quarter: (A) T. McGovern 35-yard pass to Cam Furtado, P. DeLuca XP good; (KP) J. DeLuca 6-yard rush, C. Baker XP good; (KP) Giovanni Fernandez 3-yard rush, C. Baker XP good; (A) T. McGovern 5-yard pass to Steve Hamerski, P. DeLuca XP good. 4th Quarter: (KP) S. Frommer 3-yard rush, C. Baker XP good; (KP) G. Fernandez Safety; (KP) Andrew Gelsomini 46-yard rush, C. Baker XP good. 1st Quarter: (Marsh) Jack McNeil 54 yard rush, XP missed; (Marsh) Jackson Phinney 4 yard pass from J. McNeil, 2pt failed. 3rd Quarter: (Mans) Anthony DeGirolamo 28 yard pass to Hunter Ferreira, Diogo DeSousa XP good; (Marsh) J. McNeil 62 tard rush, J. Phinney 2pt pass to Brendan Ward); (Mans) Nick Graham 4 yard rush, D. DeSousa XP good; (Marsh) Neil Parry 70 yard pass to Mike Catanoso, J. McNeil 2pt rush. 4th Quarter: (Mans) A. DeGirolamo 32 yard pass to Kristian Conner, D. DeSousa XP good; (Marsh) J. Phinney 6 yard rush, J. Phinney XP good; (Marsh) Neil Parry 65 yard interception return, 2pt failed; (Mans) A. DeGirolamo 15 yard pass to H. Ferreira, D. DeSousa XP good; (Mans) N. Graham 6 yard rush, D. DeSousa XP good. 1st Quarter: (NA) Chad Peterson 5 yard rush, Geoff Wilson XP good; (NA) Bobby Mylod 41 yard rush, G. Wilson XP good. 2nd Quarter: (NA) Nick Rajotte 25 yard rush, XP failed; (NA) C. Peterson 25 yard pass to B. Mylod, G. Wilson XP good. 3rd Quarter: (NA) C. Peterson 27 yard pass to Mario Bresko, XP failed. 4th Quarter: (WH) Ethan Phelps 31 yard pass to Ryan Kenndey, 2pt pass conversion. 1st Quarter: (S) Ryan Sullivan 4 yard rush, R. Sullivan 2pt rush; (S) Izon Swain-Price punt block, fumble recovery in the end zone, XP missed; (S) Jason Joseph 60 yard fumble return, Josh Cocchi XP good. 2nd Quarter: (S) Justin Ly 3 yard rush, J. Cocchi XP. 3rd Quarter: (S) Evan Gibb 1 yard rush, XP missed. 1st Quarter: (C) Dan Dillon 37 yard rush, Thomas Monagle XP good. 2nd Quarter: (NQ) Rush touchdown, XP failed. 3rd Quarter: (C) Joe Mulkay 4 yard rush, XP missed; (NQ) Rush touchdown, XP good. 4th Quarter: (C) D. Dillon 34 yard rush, T. Monagle XP good; (C) D. Dillon 28 yard pass to Tony Harris, T. Monagle XP good. Foxboro @ Cardinal Spellman – Postponed to 10/29 at 1:00. 2nd Quarter: (T) Noah Leonard 1 yard rush, John Teixeira XP good; (T) TJ Mendes 4 yard rush, J. Teixeira XP good. 3rd Quarter: (T) T. Mendes 1 yard rush, J. Teixeira XP good. 4th Quarter: (T) Brevan Walker 2 yard rush, XP failed. Canton, 1 vs. Mansfield, 0 – Final – Griffin Roach scored midway through the second half to lift Canton to a win at Gillette Stadium. With the win, Canton qualified for the state tournament. Franklin, 0 @ King Philip, 2 – Final – King Philip scored a pair of second half goals to finish the regular season with a win. Mike Rowe scored the game-winner, pouncing on a loose ball inside the area. Tyler Mann doubled the lead, taking a pass from Jason Florio and finishing alone against the keeper. Mansfield, 0 vs. Canton, 0 – Final – With a point, Mansfield clinched a share of the Kelley-Rex division title along with Oliver Ames. This marks Mansfield’s first ever Hockomock League title for girls soccer. Canton, 3 vs. Duxbury, 2 – Final – Canton rallied from a two deficit to pick up one of its most impressive wins of the season, 19-25, 17-25, 26-24, 25-22, 15-13. “After falling behind two sets to none, we came out giving it everything we had and battled for the next three sets,” Canton head coach Pat Cawley said. Cawley said Nicole Poole was the team’s glue, dishing out 37 assists and picking up 18 digs and two kills. Casey Shea and Emma Murphy were strong in the middle with 12 and 11 kills respectively – each with two blocks. Erika Lum was outstanding with 13 kills and 21 digs. Julia Panico was great in defense with 27 digs. Mansfield, 0 @ North Attleboro, 3 – Final – North picked up the non-league sweep 25-23, 25-22, 27-25. For Mansfield, Meg Hill had 10 kills and eight service points. Chloe Peters had seven service points and 25 assists and Jess Haradon had 20 digs and eight service points. Sharon, 1 @ Stoughton, 3 – Final – Val Whalen led the offense for the Black Knights with 13 kills. Foxboro @ Monomoy – Postponed to 10/30 at 9:30AM. STOUGHTON, Mass. – With two of the highest scoring offenses in the Hockomock facing off on Friday night, it’s no surprise the teams combined for 450 yards. What is a little surprising is how lopsided it was. Stoughton racked up 372 yards compared to Milford’s 78 yards — all rushing yards for both teams — and that dominance translated into a 28-0 win for the Black Knights at Anthony L. Sarno Field. “We played well,” Stoughton head coach Greg Burke said. “Milford is a good team, they’ve pounded some teams. Even though I thought we did a great job, I thought we could have been up another touchdown but a couple of penalties. Overall we played very well. The Black Knights’ defense, which recorded its second shutout of the season, gave the offense a second chance after an opening drive fumble. Stoughton moved the ball 52 yards on seven plays but a high snap resulted in a turnover. However, on Milford’s first play, a bad snap resulted in a fumble that Andrew Iverson gobbled up. Three plays later, Izon Swain-Price (11 carries, 149 yards, three touchdowns) took a counter to the left, broke free of a tackle and scampered in for a 16 yard touchdown. Josh Cocchi’s first of four extra points put the Black Knights up 7-0 with 5:29 left in the first quarter. Another turnover haunted Milford on its next drive. After converting a third down on a carry from Blake Hill (11 carries, 37 yards), a pitch was dropped with Stoughton’s Jason Joseph landing on the loose ball. 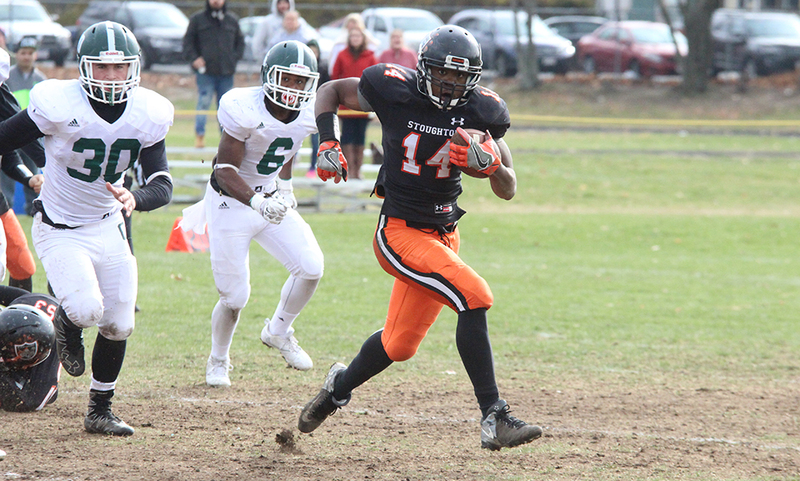 Stoughton capitalized on its second takeaway, using six plays to cover 40 yards. This time, Swain-Price found a big hole through the left side and walked in for a six yard touchdown, making it 14-0 with 1:32 left in the opening quarter. Milford’s final three drives of the first half resulted in two punts from sophomore Sean Lehane and another fumble. Stoughton wasn’t able to capitalize as their final three drives ended with a punt, an interception by Milford’s Conor Corbett, and a turnover on downs. The Scarlet Hawks were forced to punt on their opening drive of the second half and Stoughton pounced. Using an 11-play drive, the Black Knights covered 88 yards. Highlighted by 15 yard and 19 yard runs by Ryan Sullivan (14 carries, 134 yards) and 17 and 11 yard rushes by Swain-Price, Stoughton eventually punched it in on 4th and 1 from the six, Justin Ly (seven carries, 27 yards) hurdling his way up the middle for the score. Stoughton led 21-0 with 2:21 left in the third quarter. All three of Milford’s other drives in the second half resulted in punts. Stoughton used its first drive of the fourth quarter to cap the scoring. On the first play of the drive, Swain-Price used a counter to go up the left side untouched for a 79 yard touchdown. Stoughton quarterback Evan Gibb added 54 yards on the ground on five carries. Milford’s Ryan O’Toole and Jack Cappelletti combined for 28 yards on the ground. Stoughton football finishes the regular season at 5-2 overall and 4-1 in division play. While MIAA playoff seeds will be finalized on Sunday, it’s likely that Stoughton will be the #4 seed in Division 2 South. Milford (4-3, 3-2) will likely be the #6 seed and have an away game.